After an early, abortive attempt at charging $50 for Reader, Adobe Systems quickly determined that distributing the ability to view and print for free would promote sales of Adobe’s Acrobat desktop software for creating, manipulating and managing PDF files. Indeed, the free Reader was a critical piece of the puzzle. As a result of this and a few other similar choices, Adobe’s PDF format emerged in the mid 1990’s as the de facto final-form electronic document format. Adobe decided that a new business-model, in which a PDF file gains the ability to unlock hidden capabilities in Reader, could make a lot of sense. They called this capability “Reader Extensions”. Put simply, Extensions allow the free Reader to perform functions otherwise only available in Adobe’s Acrobat desktop software. Certain Extensions (Reader Save and Commenting) are available for free on a one-file-at-a-time basis via Acrobat Professional, with a EULA limit of 500 users or 500 instances (in the case of a form). It’s all a bit vague, and the EULA is that when they install the software. This product allows licensed users to deploy any desired Reader Extensions under the terms of Adobe’s Enterprise or OEM licensing models. In order to gain the maximum value from Extensions, Adobe should rescale the intended takeup point to accommodate departments and small businesses. Most electronic document implementations are introduced on these scales and in such settings. The Extensions model should acknowledge this reality. Elevate awareness of the power and value (assuming revised pricing!) of Reader Extensions. Overhaul the system for vending Reader Extensions; rely on Acrobat’s distribution base and natural turn-over in Extensions-enabled PDFs to generate demand for licenses. Let a thousand flowers bloom: encourage a diversity of implementations by ensuring the price is low enough to encourage widespread adoption. 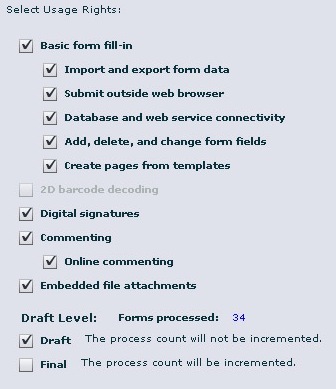 Per-user annual licensing is intended for high-volume/user forms, commenting and similar implementations. Typical end-users use interactive PDFs or may save PDF forms as a regular part of their daily work activities, with a minimum of two Reader Extensions-enabled uses per working day. Per-user pricing should scale from under $100/user/year for small organizations down to a lot less for hundreds, thousands and hundreds of thousands of users. Per-user licensing isn’t an impulse buy. Now let’s talk about any user with Adobe Acrobat Professional, a credit-card and a job to do. Perhaps they need a PDF form that can spawn additional pages and be saved in Reader, or a document that Reader users can digitally sign. This license should be sold on the basis of intended distribution as reported by the license purchaser via a web-based UI initiated from within Acrobat Professional, perhaps via acrobat.com. By “intended distribution”, I mean that the license purchaser would state their needs (Extensions) and the intended usage of the file, and the software would quote a price. Example: “1,000 users, once per month, and 200 users, about once per day”. Based on that intended usage, specific Extensions requested, account history and other factors, the price might be $543 for one PDF, $5,500 for another, and as much as $20,000 or maybe more for some PDF with truly massive intended distribution. Adobe would get to log each Extensions-enabled PDF. “Draft” Extensions would be permitted, but PDFs uploaded as replacement drafts could be analyzed for differences with previously enabled PDFs for license-administration purposes. Adobe could reserve the right to audit the PDFs usage in some anonymous way. The important thing is the tenor of the presentation. It may be serious, it must not be grossly onerous or prohibitive, or (fundamentally) intrusive. Success comes from broad-based uptake and utilization, not from nailing the occasional cheat. For all the brilliance of the PDF concept itself, and for all its thankless (if profitable) execution of Adobe Acrobat, Adobe Systems is justified, to a degree, in regarding Reader as a ticket to revenue heaven. Even so, the company has yet to seriously begin to act on the opportunity. Meanwhile, thousands of forms and other interactive PDF technology implementations slow, stumble and stall due to a pricing model that doesn’t relate to the real world of how and why organizations might consider using Reader Extensions to address their business needs. Adding a Reader Extensions vending “feature” to Acrobat, even if it was merely a link to a LiveCycle Reader Extensions Server and a payment engine, would result in significant near-term and substantial continuing revenue.